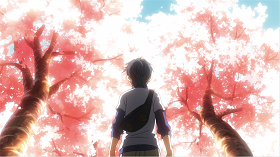 5 stars of beautiful and heartwarming anime. 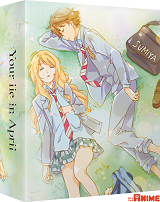 Your Lie In April is based on the manga of the same name by Naoshi Arakawa and directed by Kyōhei Ishiguro from A-1 Pictures (Fairy Tail The Movie: The Phoenix Priestess). This is Part 1 of the series and features episodes 1-11. 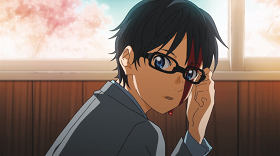 It tells the story of Kousei Arima (Max Mittelman – Aldnoah. Zero, Durarara! x2), a fourteen year old schoolboy, who was once a child prodigy on the piano. Forced to play by his overbearing, abusive and sometimes violent mother Saki (Wendee Lee – Nura: Rise of the Yokai Clan), he was on the verge of breaking onto the international scene when his mother died. At the age of twelve, he had a breakdown on stage during a competition, and ever since then, he has been unable to play. He can hear his fingers hitting the keys but he can’t hear the notes that he is playing. Now hating the piano, he has turned his back on it and spends his days with his two best friends, Tsubaki (Erica Mendez – Kill la Kill) and Watari (Kyle McCarley – Fate/Stay Night: Unlimited Blade Works). 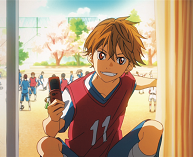 However, his whole life is set to change when he accompanies Tsubaki and Watari on a double date to meet a girl from Tsubaki’s class who has a crush on Watari. Arriving first, he sees a blonde girl playing a melodica for some children. 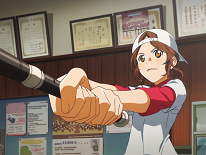 Mesmerised, he takes a photo, only to face the rage of the girl, who turns out to be Kaori Miyazono (Erica Lindbeck – Coppelion), a violinist. 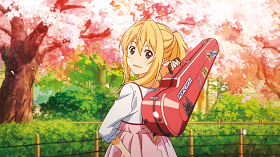 They accompany her to the Towa Hall for a violin competition, a place Kousei has not ventured since he stopped playing the piano. Many of the audience recognize him and he finds himself moved by the experience. Kaori is fragile but feisty and determines that she will give him back what he lost and help “the human metronome” to find the emotions in his music. This is a truly beautiful piece of work, one with which anyone who has ever played a musical instrument and performed on stage will completely identify. It is very well written, charming, touching and quite dark in places. The music is glorious and the animation is breathtaking in it’s detail in places. Lovely to watch and well worth adding to your collection. 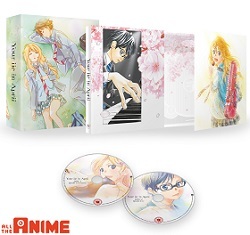 Your Lie In April is available to buy now on Collector’s Edition Blu-ray and Standard DVD.